» Posts Tagged "Tips and Tricks"
This article is related to Angular 2+. Recently, if you create a brand new project with the Angular CLI and test it in IE11, you see that it is not working (not displaying anything). It is because the required polyfills are not included anymore by default. Looking to upgrade your project to Angular 4 ? > For me, there was no code changes and my bundles became 25% smaller! Visual Studio Code has been my favorite tool to build Angular apps since 1 year ago (October 2015). I particularly like the extensions model for productivity and I want to list here my TOP 3 extensions used while working on an Angular 2 app with TypeScript. This is a must have! type “ng2-”… and you’ll get access to several TypeScript code snippets (think about code templates), some of them are available in your HTML files. This extension autocompletes filenames when you reference a file in your project, like a link to a css, a component template or an ES import. Sometimes I don’t want to import objects myself, so I auto import them! What are your fav extensions ? 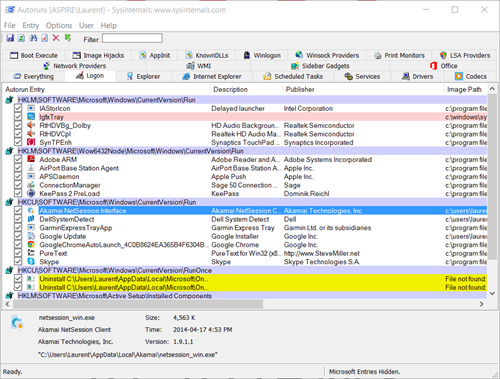 Autoruns is a free tool made by Microsoft, and runs on Windows 10 (and previous versions as well). It finds autostarting programs (add-ins, drivers, codecs, gadgets, shell extensions, …) anywhere, even the most obscure places of your PC, then it lets you turn off individual items. Note: you have the ability to filter out Microsoft-signed programs. Here are a bunch of AngularJS cheat sheets that I found very helpful while creating my training. PostSharp 4.1 (currently RC) adds support for Xamarin and Visual Studio 2015! If you don’t know this tool, I encourage you to try it! Xamarin Support, now at the same level of functionality and testing as Windows Phone. It lets you use PostSharp to build applications that target iOS and Android, additionally to Windows, Windows Phone, and Windows 8. Visual Studio 2015 Support, including light bulb integration, live code diagnostics and coding guidance, makes it easier to get started with PostSharp, and then assists you in more complex tasks. Conservative NuGet Versioning prevents unwanted upgrades of PostSharp packages. PostSharp Explorer Improvements let you see where aspects are being used in your code. Shared Projects Support makes PostSharp integration with Visual Studio more relevant in large cross-platform projects. Localizable Code Contracts allow you to customize or localize the runtime exception texts thrown by code contracts. Did you know that you can activate a preview feature (as of March 2015) in your Azure Portal called: Billing Alert Service ? It has been a while since I last used my Dell Venue 8 Pro tablet… but having heard the news, I quickly sold my Surface RT and I am using my Dell again, starting by installing Windows 10 Preview. It is a great device, but it has an atrocious battery life (compared to my iPad for example) and one weakness: there is only one USB OTG port and you can’t use USB devices with your Dell Venue 8 Pro and charge it at the same time. 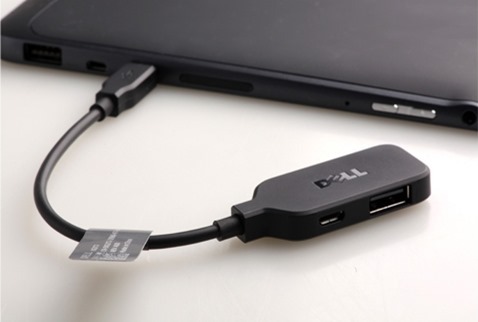 After some research, I found some cable hacks online, and then was happy to learn that Dell recently released an official Data and Charging Dongle. 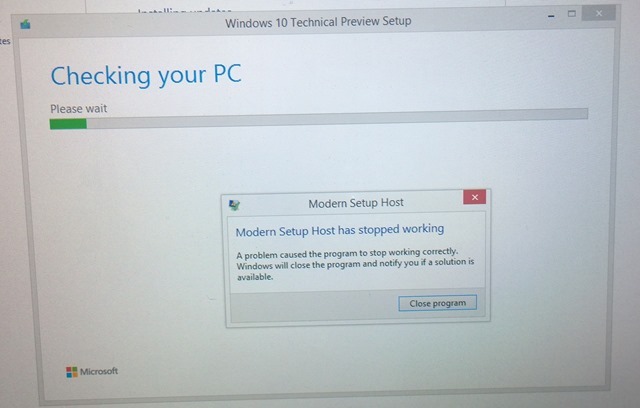 Trying to install Windows 10 Technical Preview Build 9926 on my Dell Venue 8 Pro with Windows 8.1 and gets the Error: “Modern Setup Host has stopped working”. 16 GB available disk space (32-bit) or 20 GB (64-bit). Having this much free space on a Dell Venue 8 Pro is impossile so one solution is a fresh install by booting from a USB key containing the iso file content extracted with a software like rufus. For Dell Venue 8 Pro users: Don’t forget to format the key as FAT32 and to install the 32-bit version of Win10, then press and HOLD the volume down button until the DELL logo screen shows ENTERING BIOS in order to enable boot from USB. I had an issue with this solution as touch refuse to work during setup, you might want to try with a keyboard and a USB hub. Unpack the content of the .iso file onto a micro SD Card then plug it into the Dell Venue Pro, open the SD card and run setup.exe from it. The in-place upgrade from Windows 8.1 worked for me. Touch and Wi-Fi worked at first try without any trouble. Windows Phone 8.1 has been released for developers, and will be available for all soon. Here I want to focus on the new features that help me boost my productivity since I installed the update on my phone. “Show more Tiles” (now for non 1080p phones) increase tiles density on your start screen, more tiles = more tasks done quickly. “Sync my settings” across devices, particularly interesting in IE where you can see tabs opened in your other devices. “Project my screen” (TV, PC, projetor), this feature *will* allow you to mirror your screen to an external display, wirelessly using Miracast technology and *new* WP8.1 hardware, or via USB but we need to wait for the desktop app to be released by MS first. So it is not there yet, but it sure will be an excellent business feature. The long awaited feature, now on your Windows Phone! All your notifications in one place: essential. Action center is also available under Lock screen! Yes, just swipe down on your lock screen, even if PIN protected. “This week” view is a very nice addition, I already can’t live without it! Also includes weather info for each day, perfect to schedule your next activities and movements. “Speed Dial”, quickly call your favorites contacts. Pin both “Battery Saver” and “Storage Sense” to your Start screen, they both are now separate apps which can be pinned with Live tiles, showing actual battery usage and storage info! Battery Saver also shows running background tasks, perfect to efficiently find the culprit if an app drains your battery! Mute SMS message threads (no more notifications and Live Tile updates for this thread), go into the message thread you want to mute, check out more options at the bottom of the screen, and tap on mute thread. Also, note that a setting allows you to automatically mute messages during quiet hours (which is automatically activated while you are on a meeting or via different options you can set). Cortana, the new personal digital assistant, is truly amazing to organize your busy life!! It is beta and USA only for now, but you can get it if you set both your region and language to english United States.